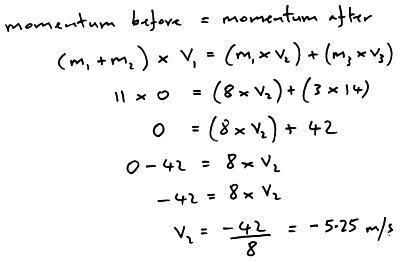 The momentum (p) of an object is found by multiplying the objects mass (m) in kilograms (kg) by it’s velocity in metres per second (m/s). Momentum is measured in kilogram metre per second (kg m/s). Example; A car of mass 2000 kg is travelling at 32 m/s. What is its momentum? When two objects interact the total momentum remains the same provided no external forces are acting (a closed system). The momentum before = the momentum after. Example; A toy car of mass 8 kg is travelling at 20 m/s. It collides with a car of mass 3 kg which is stationary. The two cars join together and move of as one object, what is the velocity of the two cars as they move off together? Example; Two objects are in stationary and in contact with each other. They are pushed apart by an explosion. The 3 kg toy car moves right with a velocity of 14 m/s and the 8 kg car moves left. What is the velocity of the 8 kg toy car as it moves left?